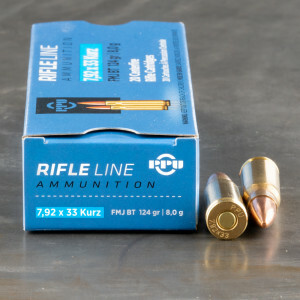 A somewhat obscure round today, especially with American hunters, 7.92x33 Kurz ammo (also known as the 7.92mm Kurz and the Pistolenpatrone M43) was initially developed in Nazi Germany before WWII. Basically an 8mm round (8.22 mm or 0.324 inch), the short, fat little round was meant to bridge the gap between pistol performance in a sub-machine gun and bolt-action rifle performance yet function well in semi- and full-auto guns giving the foot soldier a bit more fire power and range. It is a small round at less than an inch in length. The caliber usually fires a bullet in the range of 100 to 130 grains providing velocities approaching 2000 fps or more and energies just shy of 2000 ft.-lbs. After WWII, the round was used in several countries including Germany, Argentina, Belgium, Lebanon, and Czechoslovakia as well as some nations in Africa. It has been manufactured by such notables as Mauser and Steyr. Most recently, it has been manufactured by a company in Serbia. The round is still in use in the Middle East in the StG44 platform.